Living on the Western Slope of Colorado, I’ve learned to mark the passage of time by what produce is available when. Tender asparagus in the spring. Cherries in mid-summer. Sweet corn in late summer. Apples in the fall . . . . that sort of thing. Granted, not much grows here in the winter! But even that season has its own hallmark — when the kitchen fills with the nutty warmth of baking acorn squash or simmering butternut squash soup, I know it’s winter. 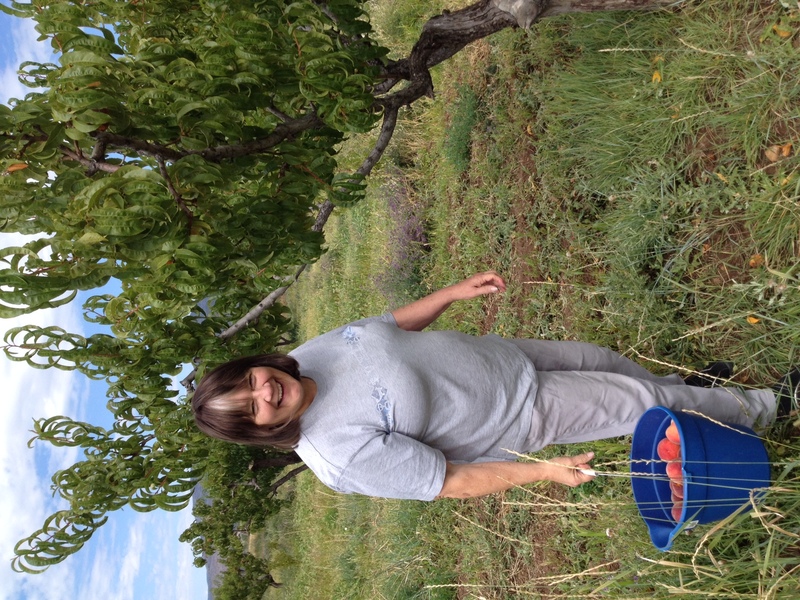 Yesterday marked the end of summer for me as Mike, his mom and I drove up Lamborn Mesa to pick peaches at Double J Orchards. 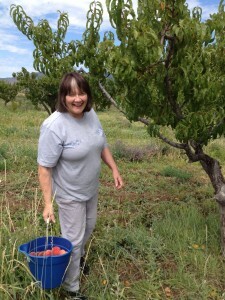 After a day of rain, the orchards were muddy and the fruit dewy. Owner Jamie Jacobson handed us blue buckets and sent us on our way. He cautioned that the peaches had been picked over, but not to be discouraged. He offered to charge us less per pound for the flawed peaches since we’d have to do a little extra work cutting off the ruined bits. Sounded like a bargain so off we went! We found plenty of perfect peaches to choose from — most about a day or two away from being ripe enough. 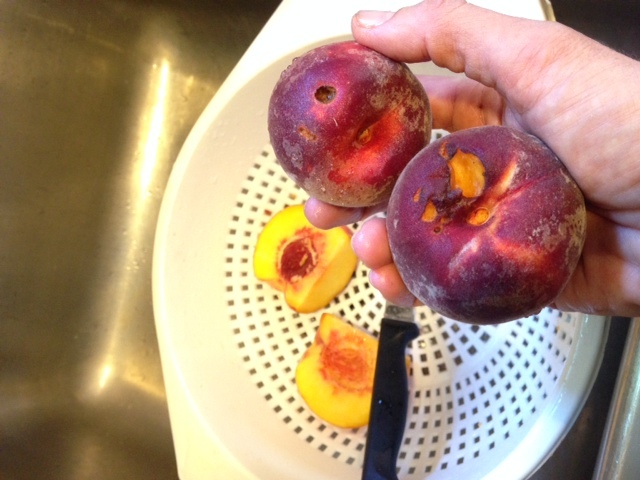 Thanks to Jamie’s suggestion, though, we went ahead and plucked peaches that had bird bites out of them. Some half gone, others missing just a few nibbles. Back home we went to work processing our harvest. 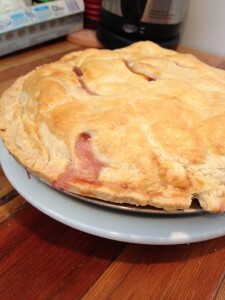 Paring knife in hand, sticky sweet peach juice running down my fingers, I dissected imperfect from perfect. Paring away, it occurred to me that had Jamie not recommended the “bird-pecked” peaches, I probably would have passed right over them. In our culture of beauty and perfection, any flaw seems like a failure of sorts, an offensive reality we’d rather not acknowledge. 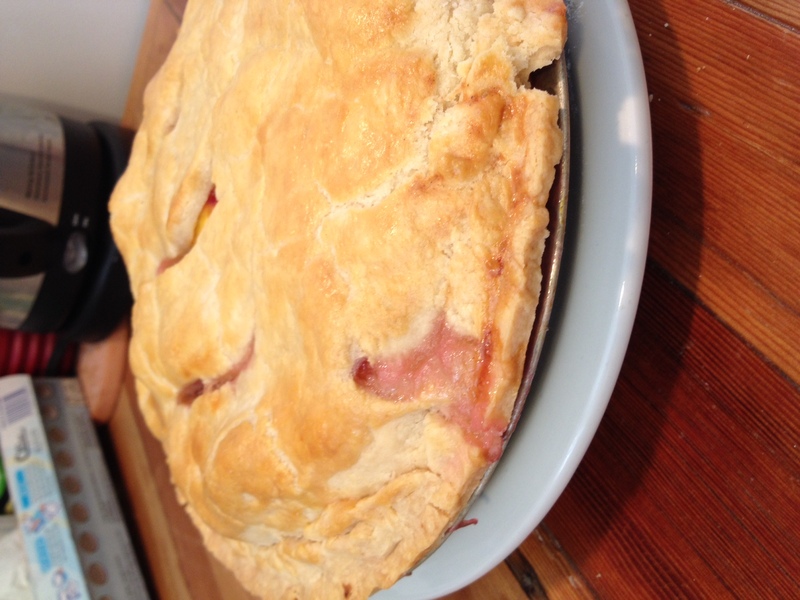 We packed those flawed peaches into an amazing butter crust Mike made, and a few short hours later enjoyed one of the best pies ever! Note to Brain: Instead of focusing on eliminating imperfections, why not see them as beautiful and sweet, like a bird-pecked peach? This entry was posted in My Philosophy on Life. Bookmark the permalink. Copyright 2013 - 2016 Grown by People, Inc.